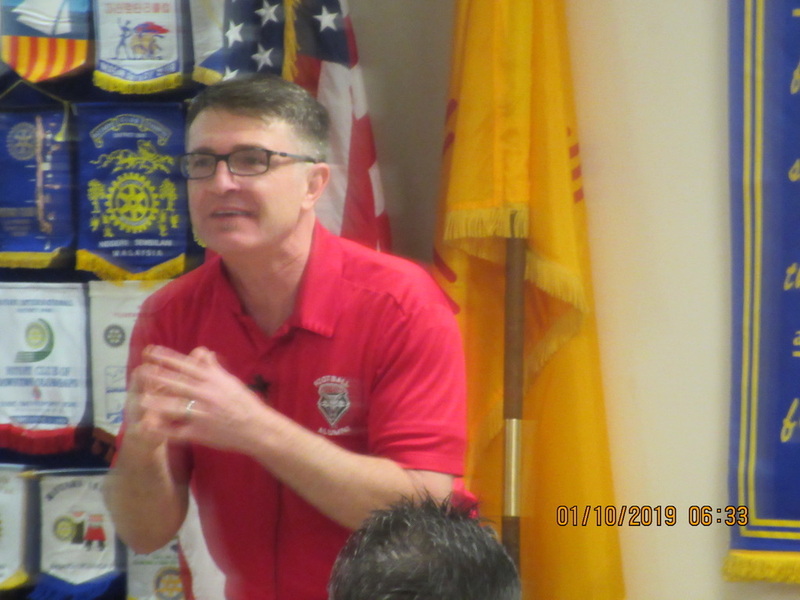 Thursday's Regular Meeting on January 10, 2019 featured Andrew Garrison, noted author and Health Expert speaking on wellness, exercise and nutrition. He was very humorous and delighted the Del Sol Breakfast Crowd. Among books he has authored is "Body Facts". He told us to put exercise into every aspect of our lives and told us to chew our food 12 times with our hands at our sides before taking another bite of food. He also explained why posture is important and too much sitting is not good for us. It was a very enjoyable and entertaining presentation. President Elect Dave Simon presented his slate of officers for the next Rotary year which were approved by the members by acclamation. Last weeks Satellite Meeting on January 7, 2019 was an opportunity for President Dacia Card to speak to the Satellite Members about upcoming events in this Rotary year. THE RDS Foundation held their meeting on January 8, 2019. Tony Pino and Ron Hensley will preside over the next Governors Ball Committee Meeting on January 14, 2019 at 5:30 PM at Nexus Brewery. All members are encouraged to attend this very important meeting as Governors Ball is only a little over three months away and there is lots to do on Sponsorships and Auction items. The Governors Ball website is nmgovernorsball.org. Sponsorship chair is PDG Bobby Wallace and Auction Chair is Brad Ekhoff. Please check the Balll website about opportunities to serve. Also it is not too early to put your table and guest list together. The Regular Thursday meeting on January 17 at Meals on Wheels will feature Rachel Speegle speaking on Community and Economic Impact of New Mexico's Medical Cannabis Program. This months RDS Board Meeting is set for January 22, 2019 at 7:00AM at Jimmy's Cafe. There will be a discussion by the Board on future Governors Ball planning. All Red Badge Members are encouraged to attend. Service Chair Chris Van Dyck reminds members of upcoming Service opportunities at Watermelon Ranch on January 19-20 and the opportunity to Chaperone the EMHS Interact Snowball on January 26, 2019.